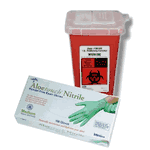 Medical Supplies, Medical / Surgical Accessories, Cold / Heat Therapy, Cleaning / Disposal Supplies and Anti-Slip Products. Medical supplies are equipment used by physicians to aid in the diagnosis, monitoring or treatment of medical conditions. We carry a large selection of medical supplies to meet any need, including medical or surgical accessories, sharps containers, anti slip products, oxygen and respiratory accessories. Medical supplies are any products that are essential in carrying out the treatment of a patient's illness or injury. Typically seen in clinics, hospitals and doctor�s offices, medical supplies are non-durable equipment that are usually disposable and cannot withstand repeated use by more than one individual. Some medical supplies, like mri accessories, are specially designed for use in a high magnetic fields.